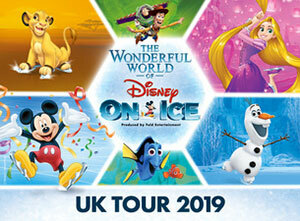 The Wonderful World of Disney On Ice will visit Cardiff's Motorpoint Arena from 24th to 28th April 2019 as part of a UK tour. This family show will bring beloved characters, both classic and new, to life through cutting-edge figure-skating, incredible costumes and stunning set designs. Tickets to see The Wonderful World of Disney On Ice live at the Motorpoint Arena went on general sale on Friday 12th October, priced from £18 plus booking fees.